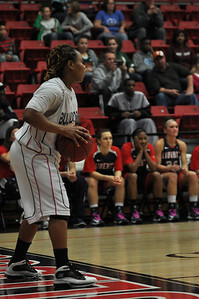 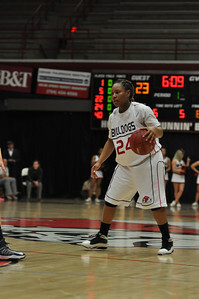 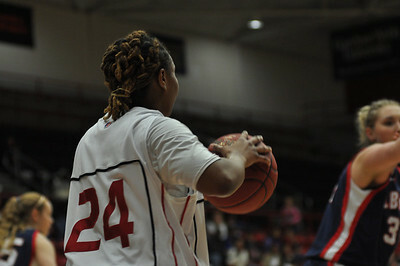 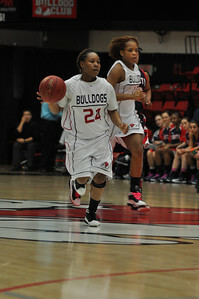 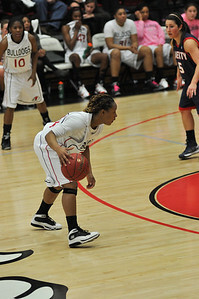 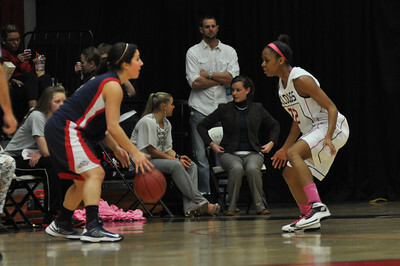 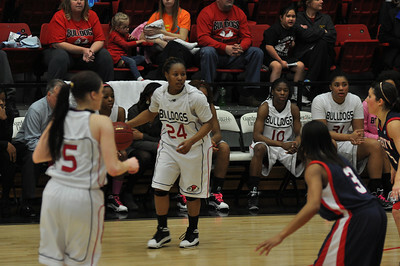 Candace Brown defends against Liberty University on February 23, 2013. 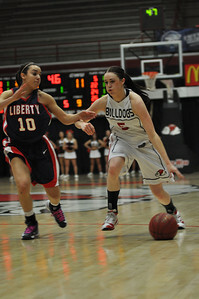 Catrina Green drives to the basket against Liberty University on February 23, 2013. 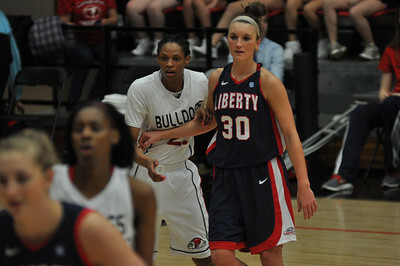 Tabby Koerner posts up against Liberty University on February 23, 2013. 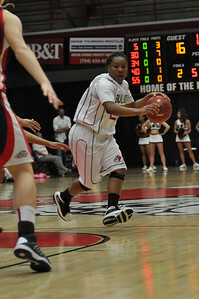 Mayhana Dunovant drives the ball against Liberty University on February 23, 2013. 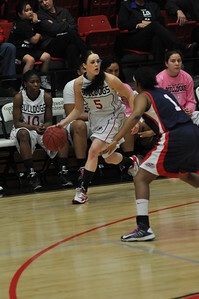 Lana Doran drives the ball against Liberty University on February 23, 2013. 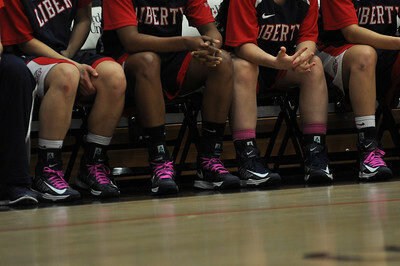 The Liberty Flames wear touches of pink for Breast Cancer Awareness Month. 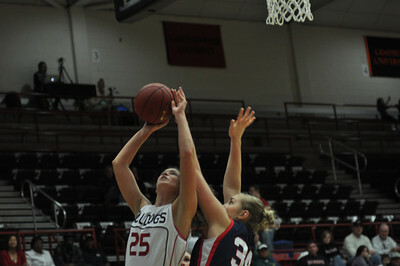 Jessica Heilig posts up for a rebound against Liberty University on February 23, 2013. 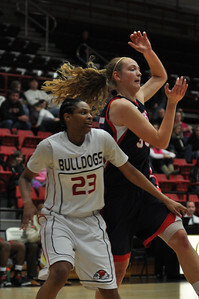 Mayhana Dunovant passes the ball in against Liberty University on February 23, 2013. 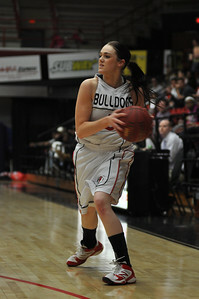 Lana Doran looks for a pass during the game against Liberty University on February 23, 2013. 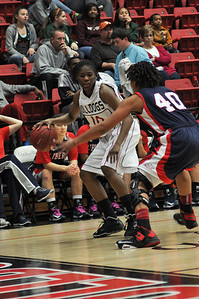 Doreen Richardson drives the ball against Liberty University on February 23, 2013. 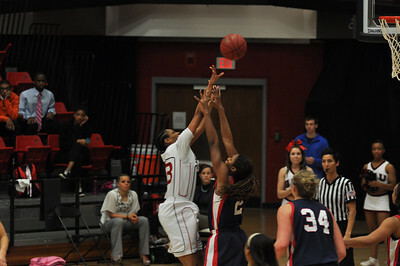 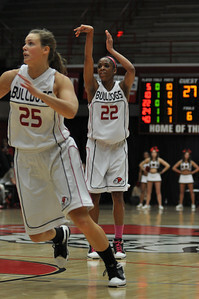 Candace Brown makes a shot against Liberty University on February 23, 2013. 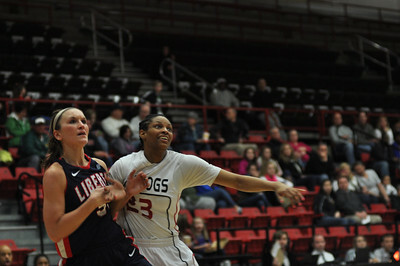 Tabby Koerner shoots against Liberty University on February 23, 2013. 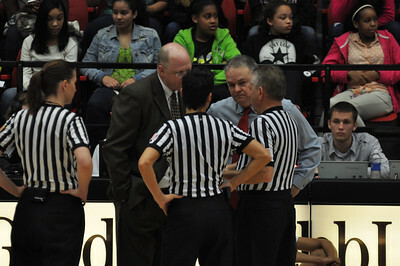 The coaches and referees dicuss a questionable call that was made during the game against Liberty University on February 23, 2013. 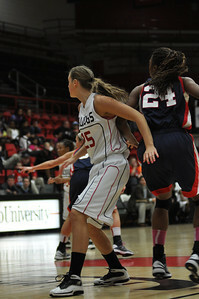 Lana Doran defends against Liberty University on February 23, 2013. 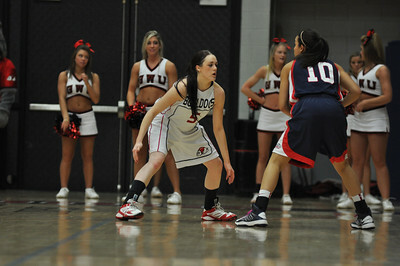 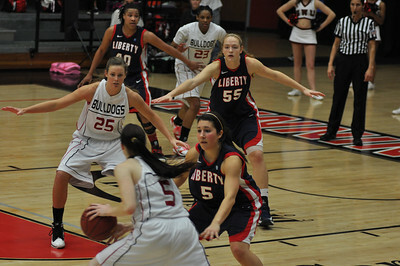 Lana Doran looks to pass to Tabby Koerner during the game against Liberty University on February 23, 2013. 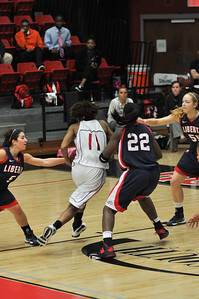 Mayhana Dunovant sets up a play Liberty University on February 23, 2013. 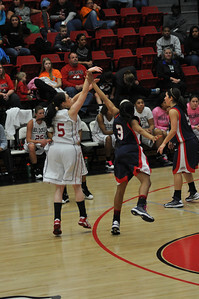 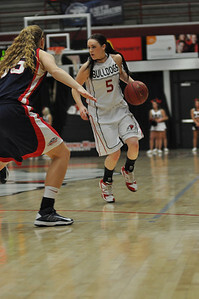 Jessica Heilig works to get open for a pass against Liberty University on February 23, 2013. 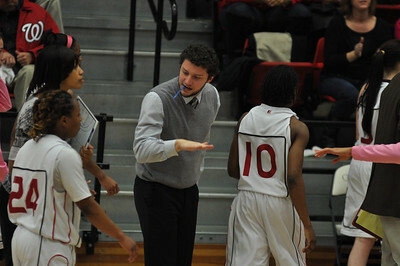 Coach Blake DuDonis congratulates the ladies as they come in for a time-out during the second half against Liberty University on February 23, 2013. 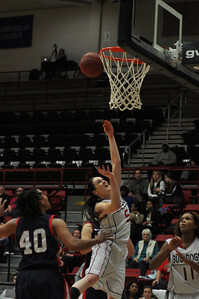 Lana Doran takes a shot against Liberty University on February 23, 2013. 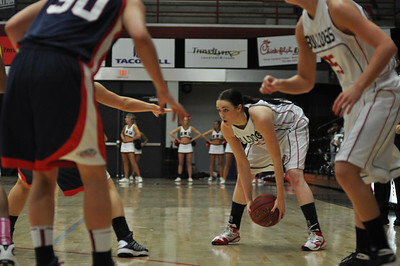 Jessica Heilig shoots down low against Liberty University on February 23, 2013. 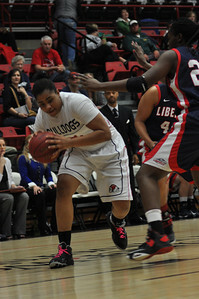 Mayhana Dunovant brings the ball down the court against Liberty University on February 23, 2013. 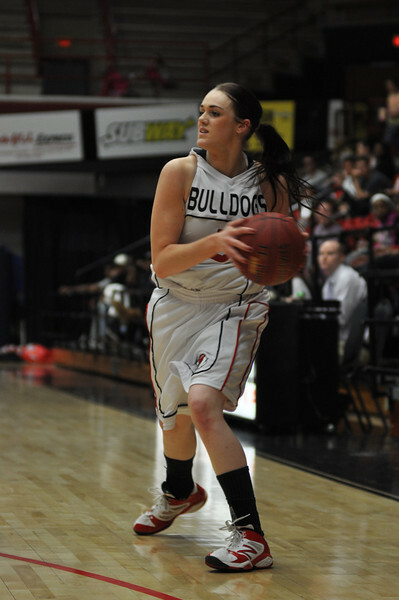 Olivia Parker drives the ball to shoot against Liberty University on February 23, 2013.